Open the application package for Android Studio in finder, and edit the Info.plist file. Change the key JVMversion. Put 1.6+ instead of 1.6*. That worked for me!. "Please note: Do not edit Info.plist to pick a different version. That will break not only the application signature, but also future patch updates to your installation." Antonio Jose's answer is the correct one. and you should be good. In the next version of Android Studio, if no java 6 is found but 7 (or greater) is found then it will use that instead. We still recommend running studio with Java 6 due to improved font rendering, but there is no work around needed if, for example, only java 8 is found. As of RC 3, we have a better mechanism for customizing properties for the launchers on all three platforms. You should not edit any files in the IDE installation directory. Instead, you can customize the attributes by creating your own .properties or .vmoptions files in the following directories. (This has been possible on some platforms before, but it required you to copy and change the entire contents of the files. With the latest changes these properties are now additive instead such that you can set just the attributes you care about, and the rest will use the defaults from the IDE installation). However there is no explanation about what options are. However no luck with that. Fortunately I was able to resolve it on Yosemite using environment variables as said in the 1.0 RC3 Release Notes. This is my launchctl command for the command line. do shell script "launchctl setenv STUDIO_JDK /Library/Java/JavaVirtualMachines/jdk1.8.0_25.jdk"
and it worked fine now.. Per the official statement as mentioned above by hasternet and aried3r, the solution by Antonio Jose is correct. As a novice user it took me a while to understand how to fix this in a correct way. After searching and understating many answers on SO I came out with the Following steps that you need to follow to fix the issue. Although the simplest solution is to update the Info.plist of android studio . But it is not recommended and not the correct way to fix it . Official statement- "Please note: Do not edit Info.plist to pick a different version. That will break not only the application signature, but also future patch updates to your installation." From next time whenever you open your terminal your studio will start automatically. 3.Now save (⌘+s) as File format: Application. Finally open System Settings → Users & Groups → Login Items and add your new application that you have just created. Log-off and login again or you can run that application manually as well.. I am using Mac OS X 10.10 also. And to fix this problem. It's all, work for me! The version of Java that the IDE itself runs with. These two can be (and usually are) the same, but you can configure them individually. And on OSX in particular, they will often be different. Java was uninstalled when I updated to OS X El Capitan. 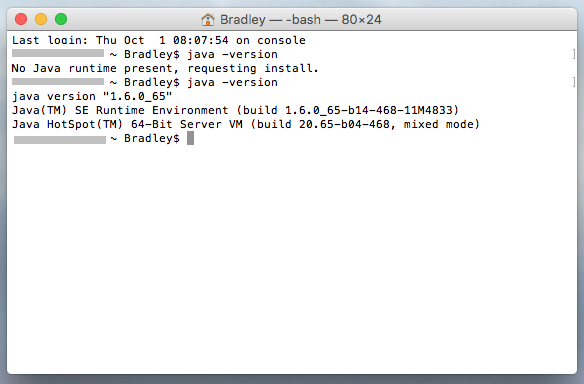 See screenshot of terminal before and after I reinstalled Java. To reinstall Java I followed this link that was provided in the Android Studio dialog box. Android Studio ran again after the Java installation was reinstalled. Edit the android studio's Info.plist file in the package so that it uses 1.7 or whatever JVMVersion you have installed. Changing the JVMVersion to 1.6+ instead of 1.6* as hasternet answered above should work too. You should install Java from Official Apple page. This one work for me, very simple, just export the environmentable var. but make sure u have the valid JVM first though. It's all, work for me too! like gehev said , so simple ! Create a new file, ~/Library/LaunchAgents/UNIQUE_KEY.plist, where UNIQUE_KEY is just an identifier. I use com.username.androidstudio. Copy the following text into your new plist file and modify it according the instructions below. Change UNIQUE_KEY to match your filename (without the .plist extension). Verify your JDK path is correct and change if necessary. I'm using 7u71 in this example. This is the same underlying solution as Antonio Jose's answer. It sets the STUDIO_JDK environment variable based on the Android Studio version 1.0 RC3 release notes. This solution uses the LaunchAgents directory rather than AppleScript to set the environment variable. As such it is mostly a difference in how your order and organize your system and environment variables. All you need to do is a few simple things, although they aren't really listed on Google's website. First you need Java installed. this is not the JDK, it is seperate. You can get that from this link. If you don't have this it will probably throw an error saying something like "no JVM installed." Second you need the Java JDK, I got JDK 7 from this link. Make sure to choose the Mac OS X link under the Java SE Development Kit 7u75 heading. If you don't have this it will probably throw an error saying something like "no JDK installed." If you haven't already installed Android Studio, do that. But I'm sure you've already done that by now. As @Gerard suggested, I summerise my original comment (https://stackoverflow.com/a/27370525/763459) as an Answer, hope it can help others who are annoyed by this issue. There's a way without running the AppleScript: edit .bash_profile (if this file doesn't exist, please create a new one , as @Gerard suggested, you can to use source .bash_profile for the first time). No editing of the Info.plist necessary! "On Mac OS, run Android Studio with Java Runtime Environment (JRE) 6 for optimized font rendering. You can then configure your project to use Java Development Kit (JDK) 6 or JDK 7." This was listed in http://developer.android.com/sdk/index.html under the system requirements for Mac OS X. Once you install Java 6 (not the JDK) from Apple as per Alonso C. Licks, you should be able to open Android Studio and reconfigure as you wish without having to mess around in the terminal, info.plist file, or other libraries. I have downloaded Intellij Idea. When I try to install Intellij, a pop-up appeared that my Mac is missing with Java RE, do you want to download it? After I downloaded missing package using Intellij, I could open Android Studio. B... James B.B... James B.
i'm dealing with the same problem and i get it worked. it is probably that your jdk version is not right. now i installed jdk1.8 and it is ok now. For those who were having trouble creating a script that launched on startup, as an alternative you can add this .plist to your LaunchAgents folder. This may be a more appropriate way of adding environment variables to the system since Yosemite decided to do away with launchd.conf. This should also work across user accounts due to the nature of the LaunchAgents folder, but I haven't tested that. 1) You may need to change 'jdk1.8.0_25.jdk' to match the version that you have on your computer. 2) I tried to use "jdk1.8. *.jdk" to try and account for varying Java * versions, but when I opened Android Studio I got the no JVM error even though if you run "echo $STUDIO_JDK" it returns the correct path. Perhaps someone has some insight as to how to fix that issue. I was able to get it to work by editing the info.plist changing 16* to 16+. Tried using the recommended method but that failed. Not the answer you're looking for? Browse other questions tagged java android macos android-studio ide or ask your own question. Setting environment variables via launchd.conf no longer works in OS X Yosemite/El Capitan/macOS Sierra/Mojave? What is the shortcut to Auto import all in Android Studio? What should be in my .gitignore for an Android Studio project? What is Gradle in Android Studio? Where do I place the 'assets' folder in Android Studio? How many serial ports are on the Pi 3?